The beginning of July is our wedding anniversary and due to a slight oversight by myself I spent the majority of it on a flight back from Moscow, I got to spend a couple of hours with Lolly on our actual anniversary and arranged to head out in the van and go somewhere for the weekend together to celebrate properly..
Our destination was Rosewall campsite in Weymouth, google said it would take us about 2.5 hours which I think is just far enough to drive for a weekend trip, we decided to take the A3 and then the A31, two roads I never wish to see again. The first issue arose getting from ours to the A3, there is a route that Lolly’s dad takes that both of us are convinced we know, we don’t and had agreed not to try taking it, before we knew it we were trying to work out the route, we failed miserably and it took an age to get to the A3, one unimpressed wife, especially as the sun was blazing and we were stuck in a van. The A31 wasn’t much better, there was traffic leading up to the A31 on the A3, for a while we were belting along before we hit the first roundabout, one of many all of which came with a queue to reach them, progress was slow, really slow, it was so bad we pulled off the A31 around the new forest area into a little pub for lunch, annoyingly I can’t remember the name of the pub which is a real shame as the food was excellent and I recommend a visit, if I remember I will update the post. After eating we carried on to Weymouth in rubbish traffic and reached our destination just before Lolly was about to explode, she also made me promise no more weekend excursions more than an hours drive. We booked in, found ourselves a spot with a nice view looking out to sea, grabbed the bikes and headed off for a ride, we made our way to the coastal path and it became clear very quickly that it was completely unsuitable for bikes, we headed back to the van, dropped the bikes off and went back the way we came on foot. We followed the path down to the beach, the beach was a large pebble / stone beach with boulders thrown in for good measure. 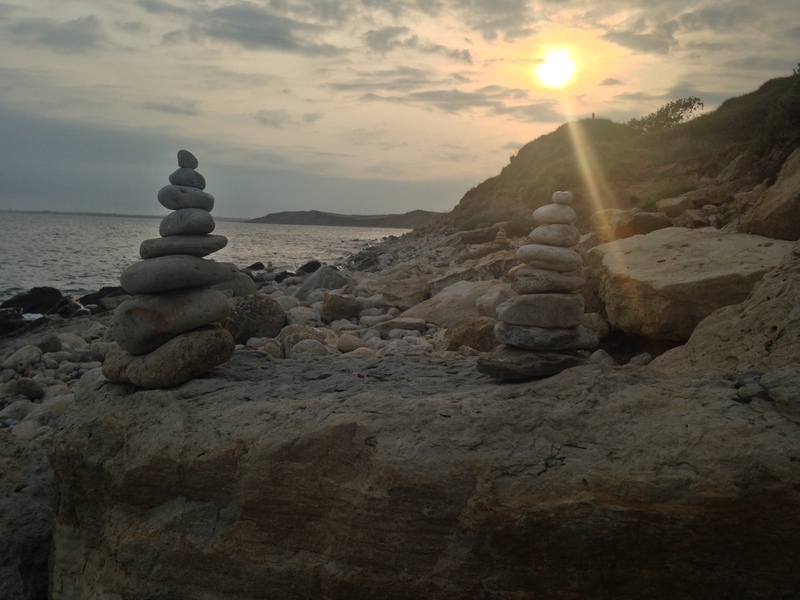 In Ibiza, along the shoreline, especially where there are rocks people build little stone towers, seems they do the same here so we decided to make a couple of our own. We spent a couple of hours clambering about the rocks, watching these weird things hop about out of the sea, they looked like wood louse and shrimps but weren’t either, very strange! We then followed the path up past the pub which gave us lovely views out over the bay. As the sun started to set we made our way back as cooking in the dark is always a bit of a challenge, we swerved into a pub just by the beach called the smugglers inn, we had a drink, contemplated eating as the food looked awesome but stuck with our plan and walked back to the van to cook some chicken on the cob. Back at the van we got our chicken on the go, made some drinks and settled in for the evening, about 15 mins into cooking the heavens opened, prior to the rain there were loads of fire baskets alight outside campers tents or vans, they went out pretty quickly! Having a lid means you can leave the cobb doing it’s thing in the rain which to be fair stopped after 20 mins or so. Following the rain was a quite spectacular electrical storm, we sat up for about an hour after we ate watching the lightshow before turning in for the night, dinner was lovely, Harissa chicken with avocado salad and cous cous. Next morning was a bit of grey damp affair but in no time at all the sun came up, perfect for a picture of camp mashley! 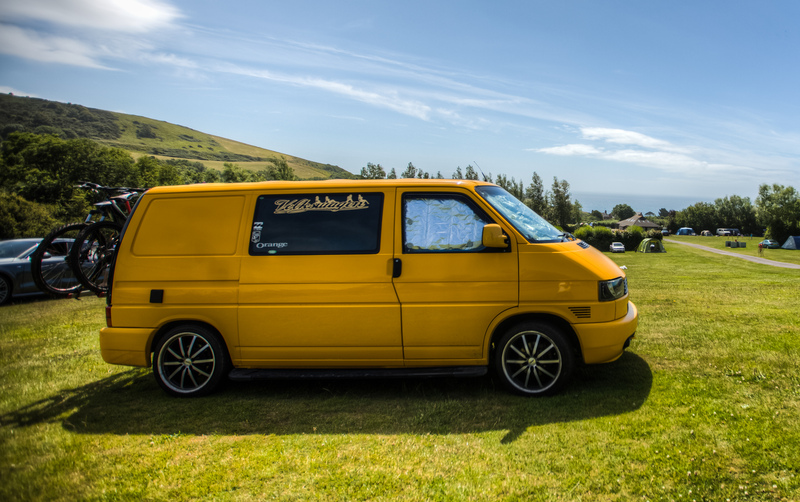 Rosewall campsite is a bit like wild camping in the sense there are no pitches, you just find a spot and that’s you for your stay, there is a shop that sells all sorts of things, milk, biscuits, bbq food, camping supplies and local beer! The toilet and shower blocks are well maintained as are the washing up areas. There are two blocks, one at the top of the hill near the shop and one at the bottom. The bottom of the hill is flatter but at the expense of the view, we found a flat spot at the top of the campsite with a really nice view out to sea. We drank plenty of tea and got some breakfast down us whilst the campsite started to fill up. 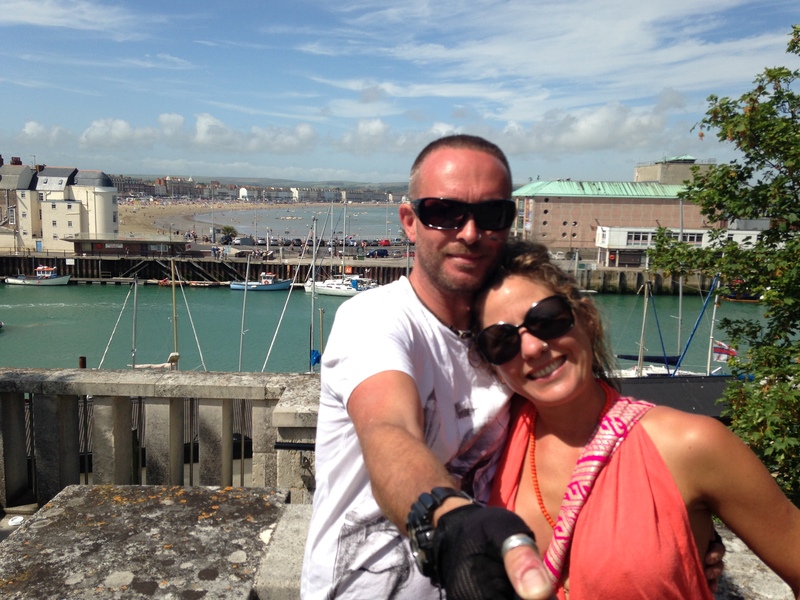 Our plan was to grab the bikes, head for a ride to Weymouth and possibly on to Portland, a small tied island which is the southern most tip of Dorset. 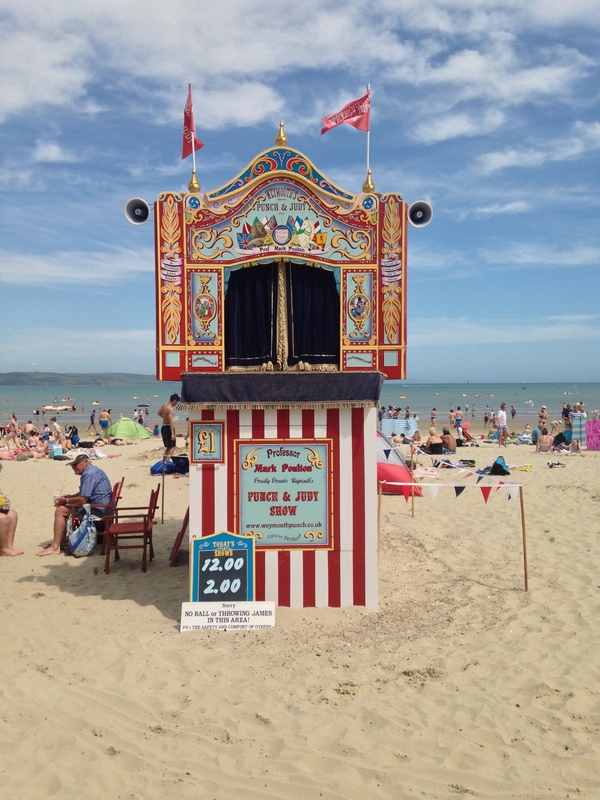 The ride into Weymouth took about 15 minutes and our first stop was the beach, we arrived just in time for a punch and judy show which is not something I woud bother with but Lolly wanted to watch it, while I went to get a couple of beers, Lolly found us a spot and put a couple of quid in the donations box. I’ve got to admit, the show was really funny, it’s main content was for children but there was quite a lot of stuff that was clearly for adults without being risque or offensive for the kids, i’m glad we stopped to watch it. From here we rode to the harbour, all around there are little coffee shops, restaurants and kids with their parents on the harbour wall fishing for crabs, they caught plenty! Just up from where this photo was taken is Nothe park and fort, we stopped for a delicious sandwich and then pressed on. We followed the coastal path which for most of the way hugs the coastline but deviates between that and residential areas, this is where we came across Sandsfoot castle, a ruined castle set in a little landscaped park that sells amongst other things very nice ice cream which of course tried! It had taken us about 2 hours to get this far as we kept stopping to look at things or eat, we were less than halfway to our destination, I knew we had a way to go and wasn’t looking forward to the ride back and in my usual style got a bit grumpy. Next stop was Chesil Beach, we locked up the bikes and walked up the pebble dune to see what was on the other side, ferocious sea and wind with some nutters in a tent was what was on the other side! I think we lasted about a minute at best before we decided being blown to pieces wasn’t that attractive and headed back to the bikes. At this point I really didn’t want to carry on and just wanted to turn back, i’d had enough riding bikes and we had a long ride home but Lolly really wanted to reach the island, reluctantly I agreed and we cycled over, when we arrived we cycled through a kind of marine industrial estate, past that we followed the path to a dead end, turning round we found a little pebble launch called scimitar wharf which it turns out is owned by Scimitar diving, we both had a drink each so we sat down, drank our drinks and then started the journey back. 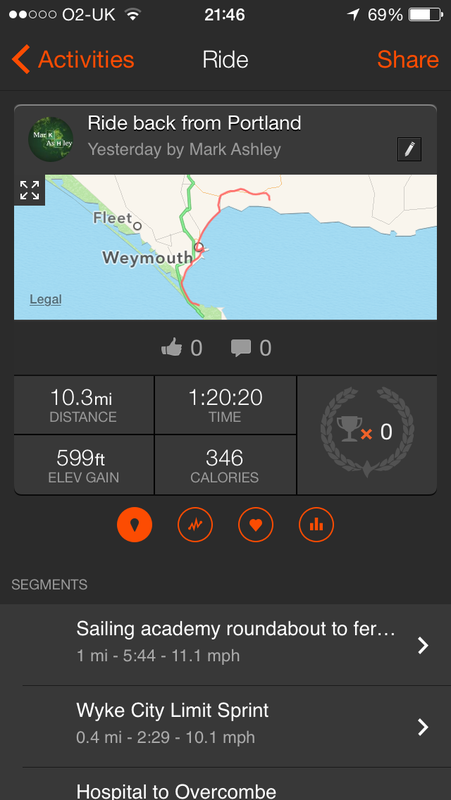 The ride back wasn’t as bad as I thought apart from the hill near where we were staying, it took about 80 mins and below is the strava output from the return leg. I didn’t realise we rode that far, a 20.6 mile round trip! Back at the van we made ourselves a drink each, got the cobb on the go and cooked up some peri peri chicken with the rest of the salad from the night before, we were pretty shattered so put the latest episode of Penny Dreadful on and settled down for the night. We had planned to get up early on Sunday, dodge the traffic and be home before the afternoon, we woke up about 10 am so failed massively on that front, I packed up the van, we showered and then went for breakfast which was lovely, then began the journey home which wasn’t that bad this time around. 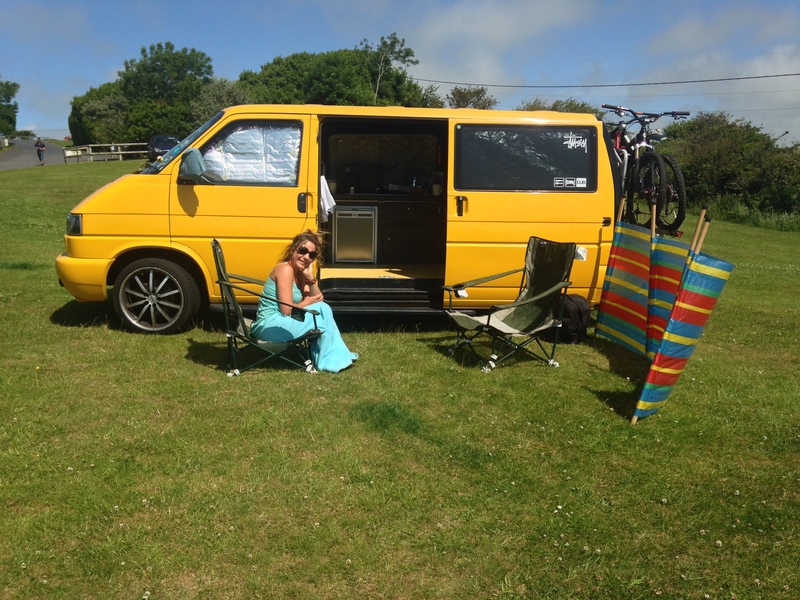 There is so much more to Weymouth than we thought and we’ll be heading back there again, just not exactly sure when, if you are heading that way then I really would recommend the Rosewall campsite.